“I am thrilled that Dean has joined our team. He is a friend and valued colleague of many years. His knowledge and depth of experience in advanced document capture technology will greatly benefit the overall success of Ephesoft. Ephesoft, Inc., the industry leading developer of document capture and analytics solutions that liberate meaning through machine learning, announced today that Dean Hough has joined the company as its Vice President of Engineering. Hough has joined the executive team and will be responsible for Software Development and Quality Assurance (QA), ensuring greater synergy. His priorities include expediting the development process, making continuous product improvements to Transact and Insight, and expanding the development team at Ephesoft’s headquarters. Hough brings over 30 years of document capture knowledge and business leadership to Ephesoft. 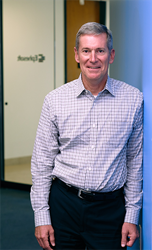 His remarkable career in the document capture space includes being the Co-Founder, Board Member and VP of Engineering at Kofax. He also held leadership positions at Filenet, Laserfiche and Computer Systems Innovations (CSI). Hough has already expressed his excitement internally to the company and is taking a hybrid approach to his new position. “Our goal is to achieve greater responsiveness and seamless communication internally and with our partners and customers. We will leverage our efforts to better understand our customer’s perspective and goals, develop innovative features and accelerate deployment. We intend to attract top talent to help meet our growth projections,” Hough stated. Outside of the office, Hough is a competitive track and road cyclist, who has won over 100 races and tried out for the 1984 Olympic cycling team and as well as competed in the World Masters Cycling Championship in Austria. He holds a Bachelor of Science degree from San Diego State University along with classes towards an MBA at Stanford and computer science classes at several Irvine colleges. Hough lives locally in Orange County. Ephesoft, Inc. delivers intelligent capture technology on a private or public cloud platform that extracts meaning from unstructured content. With a focus on efficiency and reliability, Ephesoft has crafted the next generation of intelligent document capture technology that allows organizations to automate and streamline mailroom processing and other document-based business processes. Ephesoft is headquartered in Laguna Hills, California, with regional offices throughout the US, EMEA and Asia Pacific. The company is undergoing rapid growth and has customers in over 30 countries. To learn more, visit ephesoft.com.